The total number of registered voters in Coconino County for the upcoming November 6, 2018, General Election has reached a record high of 83,239 registrants, according to information released by the County Recorder’s Office last night. This surpasses the County’s previous record of 81,461 registered voters set at the Nov. 6, 2016 General Election. 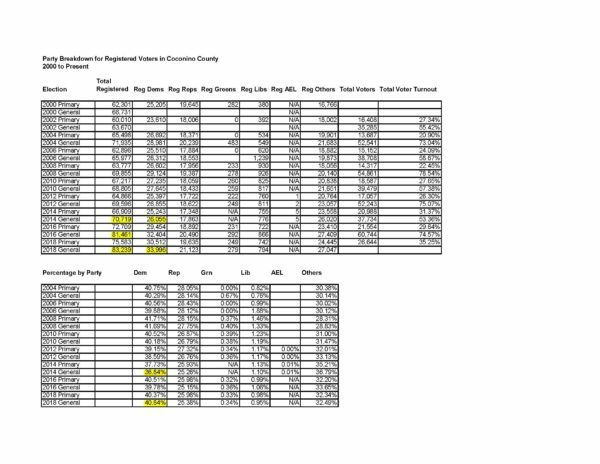 The political party breakdown of registered voters in the county is: Democrats 33,996 (40.84%); Republicans 21,123 (25.38%); No Party Affiliation 27,047 (32.49%); Libertarians 794 (0.95%); and Green Party 279 (0.34%). For information about your voter registration status or early voting call the Elections Office at 928-679-7860 or 800-793-6181. Posted in Latest News and tagged Voter Registration.